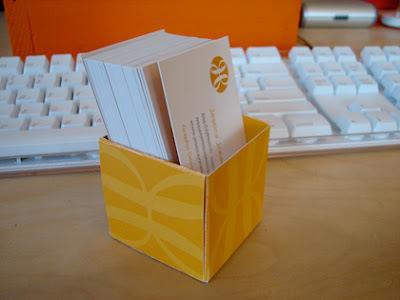 I discovered instructions for making a six-sided cube from business cards. It results in weird flaps on the outside, so I modified it to make the box above. For this box, you'll need 5 business cards and 4 pieces of double-stick tape. Follow the folding instructions here, but fold 5 cards instead of 6. (You don't need a top piece.) Follow the assembly instructions, but make sure all of your flaps stay to the inside instead of the outside. Use tape to stick down the two loose flaps on the inside bottom and the two side flaps at the top. Very clever! I will try this for my work area. I use a Fiestaware sugar packet holder to hold all the cards that I receive. They fit perfect and it's just so cute! Ooo, great idea. I should look for one on eBay. Your blog always has the neatest stuff on it!! Thank you so much for sharing the really cool stuff you find!! 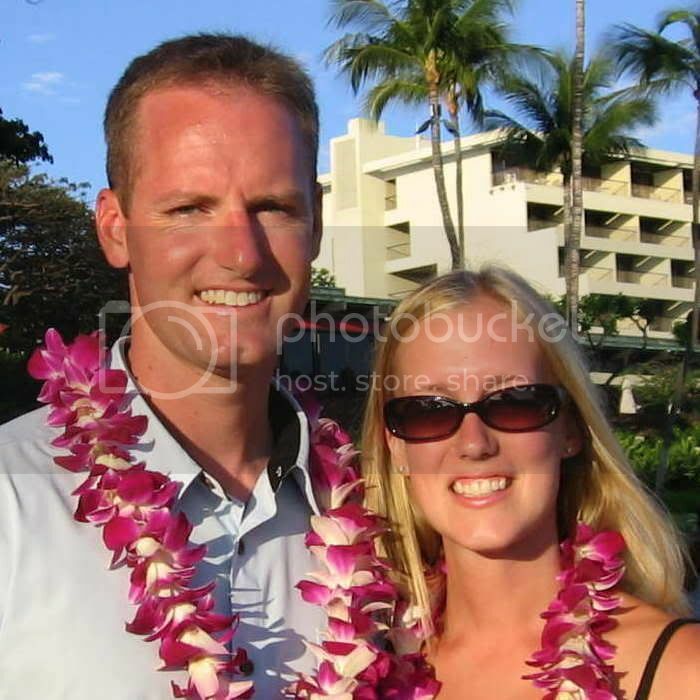 Your blog is definitely a favorite!!! Hey Julie, someone else emailed me about that, too. I've never heard of that photographer, and I doubt she's heard of me. I'd like to think it's a design coincidence. Anyway, I'm not sure how a "JJ" logo works for someone named Jessica Claire... ?? Re: the box, I saw the same instructions! I also made a box for my cards by altering the instructions but I didn't use any fasteners, just more cards. Love it! Re: the logo, hers is a JC, not JJ, as indicated by the green dot over the left swirly. I'm sure it's a coincidence. I'm sure it is. And I only see JJ because I'm used to looking at mine! i say this late last night and did it first thing this morning when i got to work.. Our business cards are vertical so the standard holders are no good. I used Glue stick to hold it all together. I'm sure my boss will love the fact that i used company time to do crafts. lol I made one for him too! Maybe that will make up for it. I love this box! I just made one! This worked out great for me as my card is flood coated with a PMS color on the back. I will do it at work for sure, since I am a package designer. This will also work for a few clients of mine. They will be happy when I give it to them. thanks for sharing this - what a great idea for recycling business cards! It was so quick and easy to do!!!! It looks pretty good, unfortunately my business cards are laminated so when I fold them, the color crackles and breaks. But it still looks cool! Thanks for posting this! I'm sitting at my desk and just made one, what a great little crafty project!